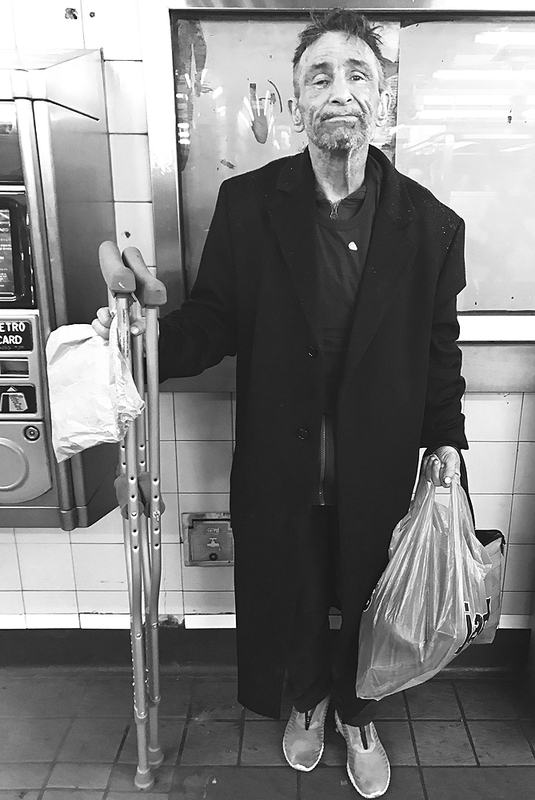 Bill Johnson, 60, jobless, homeless but not necessarily hopeless, stood in front of Café R, along Manhattan’s Koreatown stretch, 33rd Street between 6th and 7th avenues recently this month. He wore a long dark, navy blue coat and underneath that was a blue shirt and maroon fleece zip-up jacket, dark navy blue pants, and beige sneakers. He was also carrying a pink and blue stripe purse, a brown paper bag, and he supported himself on two crutches. Johnson is from Pennsylvania and has been living on the streets for almost two years. “I used to live in a shelter by 28th Street, but I got kicked out. I ruined everything because of my drug addiction and fighting with other clients [of the shelter]. But I am on my six-month cleansing now, so I think I’m on the right track,” said Johnson. 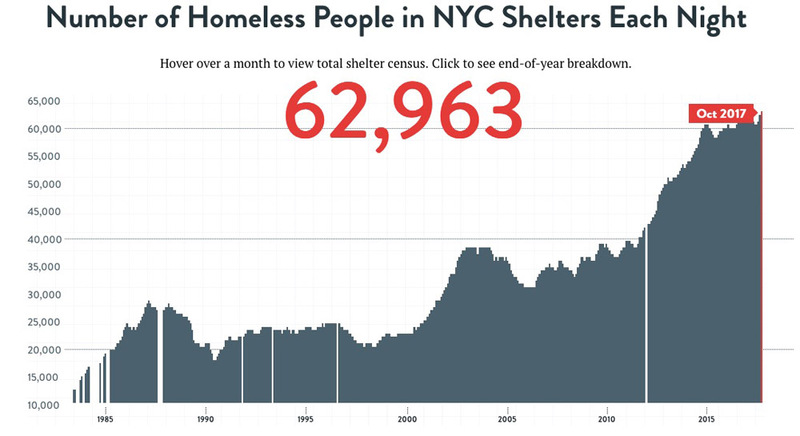 One of the realities of being homeless and in need of city provided shelter is this: Fights can result in eviction from homeless shelters, according to policy re-issued in 2000 by the City of New York Department of Homeless Services Adult Services. 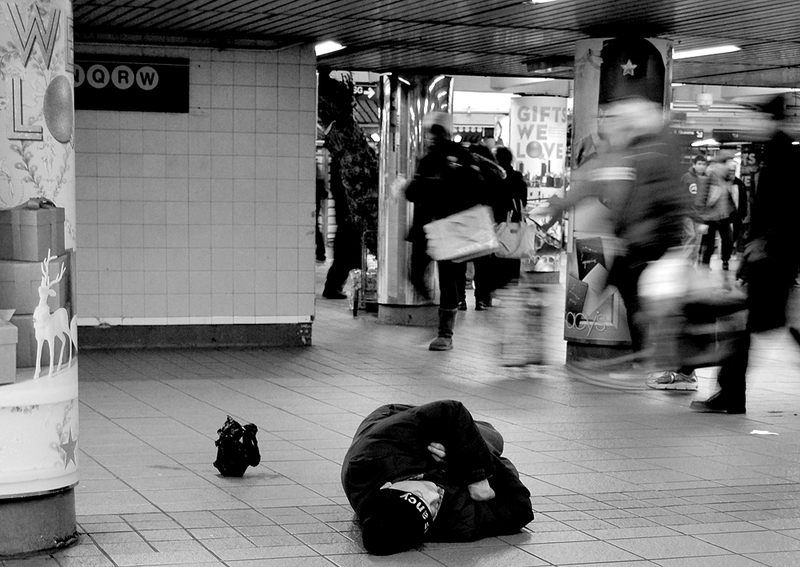 Thousands of non-sheltered homeless people live on the streets, in the subway systems and in public places around the city. Many have serious mental illness, addiction disorders or other severe health problems, and single adults have much higher rates than homeless families, according to the Coalition for the Homeless. Christian Sacco, 26, wearing a white button-down shirt, ash green jacket, jeans, and brown boots during an interview on a Sunday in late November, said Palermo, Italy where he was born, has a homeless problem and that he had not expected to see so many homeless people here in New York City. “It’s very sad to see when you walk by and these people are sleeping on the floor and people just pass by them,” he said. “But what can I do? What can we do? We can’t do anything, or not, unless the city can do something about it,” Sacco said homeless people in Palermo have been victims of violent attacks such as, when people burned homeless people as they slept. Except for isolated incidents, this reporter was unable to find any recent reports about street violence against homeless people, but a 2016 report by the National Coalition for the Homeless showed a decline in reported incidents. Information according to the Coalition for the Homeless. Sacco lives on the Upper East Side of Manhattan. He moved to the United States about 18 months ago and works at Buon’Italia, located in Chelsea Market, at the Salumeria section of the store. Sacco takes the subway train to work and regularly sees people begging for help. He recalled a subway ride when an elderly woman was asking for donations for her daughter. He thought it was another scam just to get money from straphangers. “You don’t know whom to trust,” he said. When he got off the train, he saw her laying on the ground. He gave her $15; she thanked and showed him a photo of her daughter. PIcture by Kristine Vivar. Copyright © Kristine Vivar 2017. “It is extremely stressful not to have a place to stay,” said Chelsea Birenberg, 27, recalling her experience as a homeless person when she was traveling in Europe. “I think the government should help the homeless people because it’s going to be an advantage for the state.” She also said that homeless people are unproductive, but once the government grants them assistance, they can be “productive citizens,” giving back to society. She also said that mental illness is one of the major causes for a lot of homeless people living in the city. Birenberg, wearing tan overalls with a black long-sleeve shirt underneath it, white fabric lace-up, white high socks, and cheetah print prescription eye-glasses when she was interviewed, said he would personally help people in need when she was able. Those who study homelessness, if they were ever able to engaged her in conversation as this reporter did, provide informational research about the reasons so many are homeless. They could explain, for example, that many homeless people had jobs and stable residences and were “productive citizens,” until social and economic factors intervened, causing a rapid deterioration in their living situations. The two biggest factors driving homelessness are poverty and the lack of affordable housing, according to information from howstuffworks.com. Other research concurs.